One of the cards that turned some heads when M13 was spoiled was Worldfire. The reaction from the internet community was understandable in a lot of ways. Commander players often think that if a card costs more than six mana, it’s a “big n’ splashy” meant for Commander, rather than for Standard, and definitely not intended for use in Legacy, Modern or Limited. Setting that conceit aside, the community reaction to Worldfire was largely negative, and playing it was predicted to be another acrimonious thing to do in Commander. Worldfire received more official attention as well. Before the official Commander forums went down – ironically, in fire of its own at the site’s hosting facilities – the Rules Committee stated that they had no intention of banning Worldfire pre-emptively, and that they intended to ‘watch it closely’. Mostly this means two things: firstly, it is widely accepted that it has the potential to be unfun, and second, if you follow the letter of the Rules Committee ban list, it’s totally legit to burn the world down. The idea that Worldfire would not be banned came as a shock to some rules and systems analysts out there. The justification for the banning of Sway of the Stars was that it made (nearly) everything that happened before its resolution a pointless exercise. How much damage players had taken, what sort of board position they had, and how many cards they had in hand is all rendered irrelevant by the resolution of Sway of the Stars. Yet, it cannot reasonably be argued that Worldfire does not also meet all these requirements as well, since it levels the board, resets life totals and empties each player’s hand. In fact, Sway of the Stars offers a kind of asymmetry, a place where advantage might be found. You can float mana for the new hand of cards in the fresh world you’re about to arrive in, and generals on the battlefield would get shuffled into their owner’s libraries, leaving those with their generals in the command zone with a solid advantage. Worldfire is rather less generous; you could float mana, and it would typically avail you nothing because you would have no spells or activated abilities to spend mana on. It is the lattermost feature on Worldfire – where each player’s life total becomes one – that sets it apart from Obliterate and similar effects that remain unbanned. It helps that the last sentence on Worldfire is also a pun; each player’s life total becomes one, as in uniform with each other, as well as each player’s life total being set to a particular number. So, what do we do with it? Many players are content to leave it in the binders, or trade them away. Why should we leave it unused and unexplored? We often play spells in the eight-plus mana range that end the game. Worldfire just requires a little bit more work. Or, a little less, when you consider our first option: Radha, Heir to Keld (as a general). This combo is incredibly simple: generate eleven mana, four of which must be red and one of which must be green, cast Worldfire with a Red and a Green mana remaining in your mana pool, and then once the ashes settle, cast Radha from your command zone. Why Radha? She’s one of three of the most aggressively costed generals with red in their colour identity capable of doing at least one damage to opponents, and the only one of those three in green. Green supports mana acceleration, which makes casting an early Worldfire much more likely. Since Worldfire creates the same game state whenever cast, it makes sense to cast it as early as possible (if you can then win). Of course, you might cast Radha during the pre-Worldfire game, so it would not be unrealistic to need an extra four or even six mana, but the results are basically the same. Less complicated is using Vela the Night-Clad. Running Vela means you’ll probably be in three colours without green, but you’ll be in black and blue which will allow for tutors and are ideal control colours. Vela offers a simple way of winning: with Vela on the table, cast Worldfire. 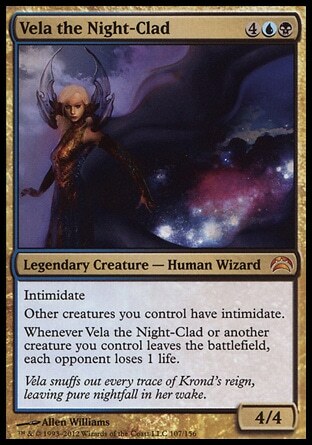 The interaction is also straightforward; Worldfire resolves, exiling everything and setting each player to one life, then Vela’s trigger goes on the stack which resolves in turn dealing each opponent at least one damage. The salient feature of this kind of card is that it leaves something significant behind when it leaves the battlefield (as opposed to the plethora of creatures that do something when they ‘die’). There are not many ‘leaves the battlefield’ effects that are useful without the aid of another card. Your options are limited to Vela, Thragtusk or Grixis Slavedriver. The next step beyond Vela and stand-alone cards are cards that work well with one or more others to create a similar situation. Most common is the Oblivion Ring trick. The interaction is almost as simple as Vela’s: You use Oblivion Ring on one of your own creatures, cast Worldfire, and shortly thereafter, your creature reappears in a world of ash and players in critical condition. The creature of choice? Bogardan Hellkite, because he can off 5 players on his way back in. This method is almost exactly the same as the one involving Vela, with two exceptions: you need a third card in the form of a creature to win, and there are perhaps dozens of cards that could substitute for Oblivion Ring. Journey to Nowhere, Admonition Angel, Oubliette, creatures that ‘champion’ others (like Changeling Berserker)… there are plenty to make this work. Given that Worldfire puts players at one life, nearly any creature will do, with preferences given to creatures that can do damage as they enter play (like Bogardan Hellkite or Fire Imp), or ones with haste, so they can get busy dealing with players as soon as possible. Much like the Oblivion Ring or ‘Flicker’ effects, one of my favourite mechanics from the distant past was phasing. Yes, it’s clunky in the rules, and is counterintuitive in a lot of ways, but it remains one of the weirdest things that can happen to cards in Magic. Around Weatherlight, one of my favourite card combos appeared: Teferi’s Veil with Jokulhaups. Swing with your creatures, the survivors phase out with Teferi’s Veil, destroy all the creatures, lands and artifacts with Jokulhaups, and then continue the beatings on your next turn as though nothing happened. This might not have been in Standard (called Type 2, back then), but it was legit at the cafeteria table I played at. At any rate, Jokulhaups is an ancient analogue for Worldfire, and Teferi’s Veil gives you an easy way of making creatures temporarily invulnerable to it. Moreover, all you need is one creature to survive a combat step, and Worldfire is a winner. 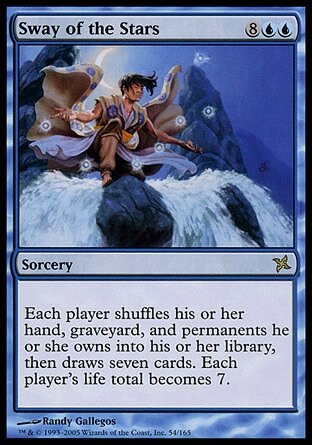 Similar to this is the longer-term Flicker-effects, like Ghostway, Liberate or Turn to Mist. These are now worded to bring the creature back ‘at the beginning of the next end step’. That means if you cast it during the end step of the player just before your turn, they will not have returned yet during your main phases, and it will be perfectly reasonable to cast Worldfire, and then destroy players on your next turn after your creatures return. A much more recent, but still very enjoyable mechanic from Time Spiral also makes this easy. Suspend is usually the go-to mechanic for players looking to affect future turns without needing to spend, or even have resources on those future turns. Suspend allows players to pre-pay for a delayed effect, which is perfect if you plan on having an apocalypse in between the time you pay and the time you want your delayed spell to arrive. Jhoira of the Ghitu is infamous for this, and for many, the announcement that the Rules Committee would not pre-emptively ban Worldfire was tantamount to Jhoira players needing to add one more card to their decks. One particular card with suspend (that Jhoira does not have access to) stands out among its peers: Roiling Horror. Roiling Horror is nearly impossible to answer, kills players outright during your upkeep step in a post-Worldfire game, and makes it harder for another player to kill you, as your life total slowly increases. Of course, there are plenty of creatures with suspend, and they each will do just fine, even though they lack Roiling Horror’s finesse. Finally, stack-based combos. These combos are perhaps the least likely to resolve because they can be so mana intensive. They generally involve casting Worldfire at instant speed, usually with something on the stack below it. Worldfire is natively a sorcery, which means you will need one of Leyline of Anticipation, Vedalken Orrery, or Quicken to make it work. A specific example might be to cast Skitter of Lizards, and then while the critter is on the stack, cast Worldfire. Worldfire resolves first, obliterating everything, and then Skitter of Lizards resolves, leaving all the players at the mercy of someone’s house pet. This seems no less likely than the Oblivion Ring-style methods of winning until one considers that there are not many ways to cast Worldfire at instant speed, and that the amount of mana required to cast your post-Worldfire critter and Worldfire itself is enormous. You could make Omniscience part of the answer, but at this point, Omniscience could probably win the game for you without the need to dance around Worldfire. I think it bears no explanation when Worldfire is an incredibly lame play. If you cast Worldfire without some way of winning, other players are typically not going to have enjoyed the game when it finally ends. Few players are willing to start from zero and see who will win from the ashes in what will amount to be a fairly random game. You could, of course, play a lot of low-end creatures, like Raging Goblin, Memnite or Pulse Tracker in order to tilt the odds of doing well in the post-Worldfire game, but there are no guarantees that this will work and no one will like you for it. Bringing it back to Sway of the Stars, I once joked, perhaps semi-seriously, with a friend that I would eventually build a Commander deck based around Sway of the Stars, where I would cast Sway of the Stars with four extra mana, and then cast Ruhan of the Fomori. Each turn after, players would randomly be killed by Ruhan, unless they could find an answer, a blocker, or a threat of their own. It was met with a laugh, mostly for the Russian Roulette-esque endgame, but with serious promises to play against it, even though it violated the ban list. Worldfire and Sway of the Stars have equal potential to practically invalidate all game decisions before their resolution, while at the same time provide an opportunity for someone to win or at least get a significant advantage out of them. These scenarios bear an interesting question: should Sway of the Stars remain banned if Worldfire remains legal, or should Worldfire languish on the ban list with Sway of the Stars? I am inclined to think that Sway of the Stars should unbanned, but you might be colder to the idea if you’re not fond of these sorts of effects.